Few things feel as instantly upsetting as getting caught. For most, this surge of emotions dates back to elementary school, when your teacher busted you for snapping your desk buddy with a #2 pencil or squirting glue onto the chair of a whiny classmate who’d left her seat to complain about the mean songs you were singing. Today, the equivalent of the schoolroom bust feels just as bad AND costs you money and your clean driving record. It starts with flashing lights in your rearview mirror and often ends with a traffic ticket and a solid cry. But getting pulled over doesn’t always have to end this way. Check out these cop-certified tips on how to walk away with a warning. 1) Pull over in a safe, well-lit area, preferably where you won’t disrupt the flow of traffic. Then turn on your interior light—if it’s a nighttime bust—to keep the cop’s suspicions at bay. If you spend too much time creeping along until you find this perfect pull-over locale, you could agitate the law enforcement officer or cause him to think you’re a sketchball. Be reasonable. 2) Roll down your window completely; cracking the window only enough to show your beady eyes will certainly fire a red flag. 4) Politely answer the cop’s questions without being evasive or deceitful. In fact, it’s best to be cooperative, reverting back to what you learned in elementary school: If you treat others kindly and with respect, you decrease your chances of a smack down. 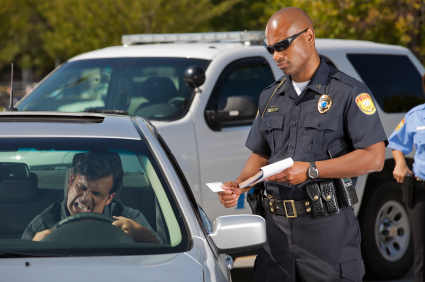 You’ll be given an informal “attitude test,” and failing it could mean getting popped with a costly traffic ticket, or two, or three. 5) Update the cop with any address or name changes on the documentation you provide. This is one of the few times you want to offer up additional info without being prompted. Otherwise, maintain your right to be silent and only answer what’s being asked of you. Nervously blathering on could incriminate you further. 1) Don’t get out of your car. Statistics show the more reasons you give police officers to reach for their guns, the less likely you’ll drive off into the sunset with only a warning. 2) Don’t make quick or evasive movements, even if you’re simply reaching for your purse, glove box, whatever. First wait until asked for documentation, and then move at a normal pace to retrieve it. Avoid lunging across or digging under the seat as it may cause the officer to believe you’re reaching for a weapon or hiding something. That usually ends poorly with a gun drawn (cop) and an overwhelming feeling of fear (you). 3) Don’t name drop other officers or the police chief, don’t try to be funny and don’t spout off your constitutional rights. Chatting it up gets you nowhere, and could actually annoy the police officer. “We know you are ‘best friends’ with the chief, and that you play cards on a weekly basis. It must be a card room that can fill Vegas,” quips former Maryland cop Tod Burke. He says most people talk themselves into a ticket, rather than talking themselves out of one. 4) Don’t say, “I wasn’t speeding,” or “I was just keeping up with traffic.” And whatever you do, don’t shriek, “You can’t give me a ticket.” Few comments get pen to paper faster. Do you have any tips for our driving community? Leave a comment below with your thoughts.